One of the most useful applications of projections relates to coordinate rotations. In data analysis, simple rotations can result in easier to visualize and interpret data. We will describe the mathematics behind rotations and give some data analysis examples. We can go back and forth between these two representations of using matrix multiplication. and carry the same information, but in a different coordinate system. What we have done here is rotate the data so that the first coordinate of is the average height, while the second is the difference between twin heights. We have used the singular value decomposition to find principal components. 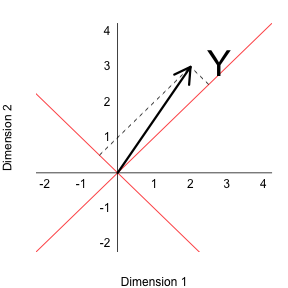 It is sometimes useful to think of the SVD as a rotation, for example , that gives us a new coordinate system in which the dimensions are ordered by how much variance they explain.